As promised, RE@L brings you the second STEM Case Study, this one from Jackie Murdock LaFrenz, another “Passionate Practitioner” from Oregon, and wife of last week’s guest blogger, Todd LaFrenz. 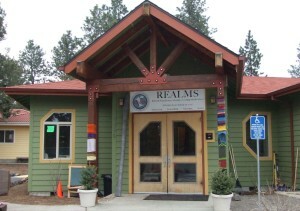 Click here to read Todd’s STEM Case Study from his school: REALMS, where they focused on Expeditionary Learning as well as the Common Core Standards. Together they make a powerful story about new ways to teach and learn. 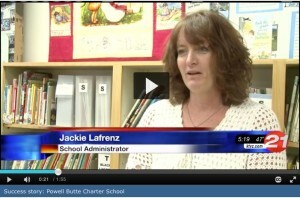 Jackie LaFrenz is the Head Teacher and 4th grade instructor at Powell Butte Community Charter School in Powell Butte, OR. The charter school began when the local district decided to close Powell Butte school, and a group of teachers and parents made a commitment to keep it going with a new mission and a new charter. Jackie helped found this unique school and served as the first school Administrator. But, missing her students and teaching, she recently returned to the classroom. In their own words, PBCCS offers “a joyful and creative educational experience where engaged students practice the skills they need to be effective citizens and stewards.” As you will note below, Jackie’s school, like Todd’s, was also committed to an Expeditionary Learning focus. Click here for more information of Expeditionary Learning. Vision-keepers are critically important in every school that has a passionate mission. Jackie helps keep the vision alive and shares it with her students, her colleagues and the parents who have chosen the Powell Butte Community Charter School for their child’s learning. 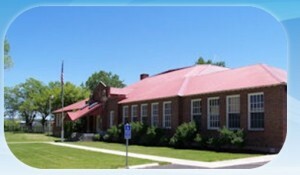 Click on the graphic of Powell Butte school above to learn more about their mission and philosopy. They believe their commitments keep them and their community on track to meet their goals. Here’s Jackie’s responses to the same set of questions we posed to Todd LaFrenz in our last blog. Click here to read Todd’s previous responses. RE@L: You are both experienced educators in award-winning, innovative schools. What led to your interest in working in schools like yours that are so different from the mainstream? Jackie: “Just like any career, years fly by and you realize the path you followed got you where you are and formed who you are today. I started teaching in a one-room schoolhouse outside Yellowstone Park because I was broke after college and the setting was so beautiful! I had students ages 6 years old to 14 years, and no curriculum or mentor to guide me. I was forced to trust my instincts and to be in tune with the developmental needs and interests of my students. “Upon arriving in Bend, I met some parents who were starting a private school because they wanted to be involved in the education of their children. Together we sat around a table and decided what our students needed and what we would do next. This created a collaborative relationship in which the teachers were trusted to guide the process. “All the stakeholders believed in the importance of providing hands-on, community based learning experiences. 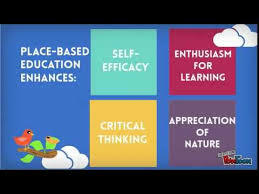 Meeting the needs of the “whole child” was our focus. Beyond the classroom, our students were engaged in music, art, PE, and Spanish in our weekly schedule. Study trips and lots of community involvement created an exciting and fun learning environment. “Looking for a new challenge I signed up to help create a rural charter school. I was attracted to working at PBCCS because the community was very involved and desperate to “save their school.” The founders wanted to emphasize place-based learning and natural resources education- two topics that intrigued me. Attracted by the idea, but naïve about the workload, I can say working at PBCCS has been my most challenging professional role. “At PBCCS, I have continued to enjoy the autonomy to create curriculum. My many excellent professional development opportunities have been very beneficial. However the reality of lack of funding, lack of district support and time consuming busy-work tasks can be discouraging. 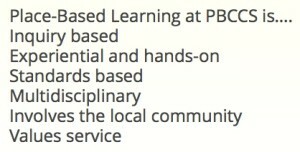 The fact that PBCCS is a small K-8 school with classes of 20-28 students is ideal. We implement curriculum and fieldwork projects on a very small scale. A few passionate, knowledgeable educators can make a big difference and lead the way. Community volunteers get to know our students and develop personal relationships. “I have been lucky to be involved in schools where trust and relationships paved the way for innovation and collaboration. My involvement with larger schools and local districts has been a bit intimidating. Due to the sheer number of students, the amount of time needed to digest mandated curriculum and administer assessments often gets in the way. “I purposely chose to teach where I feel I can teach children, not standards, and where textbooks don’t take up my classroom space. I am inspired when students are happy and engaged. I want to feel I can create a similar environment in a mainstream setting. However, I have continued to seek out small, intimate schools- where what happens is truly up to me. I want to experience the feeling that it is what I make it. RE@L: The words STEM, STEAM, Project-Based, Expeditionary, Local/Global Learning are frequently seen on the web and social media today. How does your school fit into all this, and why did your school select this curriculum? Jackie: “PBCCS is located in a rural county in Central Oregon. The local school district closed the elementary school and had plans to bus the students to town to save money. The families rallied to create a charter school and did not want their children to attend school in town. “The Powell Butte School had always been the hub of the community and students who attended did better academically than those in the local district. The community is made up of many conservative hay farmers and cattle ranchers. “The families wanted a charter school that would strive for community involvement and would engage their children in natural resources education. RE@L: What tips do you have for other reformers out there who want to make changes like you’ve made in their own classroom or schools? Jackie: “The best advice I was given, was choose your focus and don’t try to be everything to everybody in education. My focus has been hands-on learning and outdoor education. My focus has been on helping students develop positive self-esteem and communication skills. I have a million ideas and no time, so I have learned to focus on a few simple challanges I can implement. Daily, I chose what is most important to my students or school at that moment. Continuously, I reflect on what is working and what is not and adjust instruction immediately- time is precious! “Schools need to be clear about their mission and then provide professional development, guidance and time for staff to implement. If a school system wants to create, implement and sustain innovative ideas, a staff person must be designated to oversee and manage this effort! Teachers don’t have time to successfully plan and provide hands-on opportunities with community partners unless they have support. PBCCS has a position called Place-Base/Natural Resources Coordinator. Other schools that I see doing innovative things have specified a support position to make their vision happen. RE@L: For both of you, your chosen educational career is your “life’s work.” Your “passion” for what you do is the catalyst to make it happen. Is “passion” critical for what you do? If so, how do you try to instill “passion for learning” with your students? How do you keep passion alive in your own careers? “While I believe all teachers work hard, sometimes passion and innovation can be lost in the workload and daily grind. Teaching continues to become harder and harder. Kids are coming to school with more life trauma than I have ever seen before. Thanks to Jackie Murdock LaFrenz and Todd LaFrenz for their unique and helpful insights on how to bring more real-world learning to their students. RE@L concurs with their vision and has invited each of them to join our new RE@L Teachers EdTech Corner….a place to share new questions and new answers to improve K12 learning. 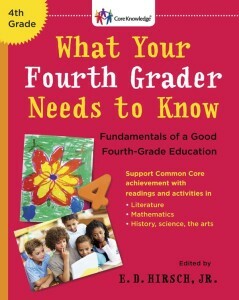 Our next RE@L Blog will discuss this new and helpful resource in greater detail. 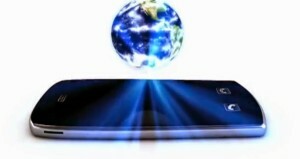 If you have any questions or comments for interest in particpating, click on “Comments” below.